The central nervous system is comprised of the brain and spinal cord. Myriads of nerves run from the spinal cord to all parts of the body in order to gather information from the environment (internal and external) which is then relayed to the brain. One group of nerves is known as the cranial nerves. There are twelve cranial nerves but the one of interest for acoustic neuromas is the eighth (8th) cranial nerve, called the auditory nerve or the vestibulocochlear nerve. An acoustic neuroma, sometimes called a vestibular schwannoma is a benign tumor that is located on the 8th cranial nerve which leads from the inner ear to the brain. The auditory nerve cells, like many nerve cells in the brain and spinal cord, are wrapped or insulated by layers of specialized cells called Schwann cells. A gene on chromosome 22 directs Schwann cells to produce merlin, a protein which is also called schwannomin. Merlin acts as a tumor suppressor preventing Schwann cells from rapidly dividing in an uncontrolled manner. When there is an abnormality or mutation of the gene, the merlin which is produced is nonfunctional and this enables the Schwann cells to rapidly multiply and form a tumor. Acoustic neuromas are typically slow growing (approximately 2 mm to 4 mm per year) and can usually develop over a period of years - although growth rates can vary. These rounded tumors typically appear as a single mass and are encapsulated. At least 95% of acoustic neuromas are unilateral (occur on one side only). Unlike many other types of tumors, acoustic neuromas do not metastasize (spread) to other parts of the brain or the body. Acoustic neuromas typically originate at a point on the vestibulocochlear nerve that is located in the internal auditory canal. Acoustic neuroma tumors may grow for many years before becoming symptomatic. They rarely shrink on their own and must, therefore, be observed carefully and treated after they have been diagnosed. The growth rate ranges from no growth or slow growth to fast growing (greater than 1.0 cm/yr). The tumor may either consistently follow one growth pattern or may alternate its rate of growth at different periods of time. An acoustic neuroma typically remains encapsulated and as it grows it slowly displaces the surrounding tissue and nerves. The tumor first distorts the 8th cranial nerve from which it develops and then may press on the 7th cranial nerve which becomes stretched over the tumor. If left untreated, the tumor grows to the point of filling the internal auditory canal and then may grow into the cerebellopontine angle or may begin to erode the surrounding bony structure. It takes on a pear-like shape and may begin to press on the 5th cranial nerve, the trigeminal nerve, which is responsible for facial sensation. Although the tumor does not actually invade the brain, the pressure of the tumor can displace brain tissue. If it compresses brain structures that control vital body functions, an acoustic neuroma can become life-threatening. Tumor growth rate at one year following diagnosis is thought to be a strong predictor regarding the eventual need for treatment. However, tumors that are larger than 2.5 cm at the time of diagnosis are considered more likely to grow than smaller size tumors. In addition, an enlarged tumor may press on other nerves and alter facial sensation, swallowing, and vestibular function such as balance and hearing. Hearing loss, which occurs in approximately 90-95% of patients, is usually caused either by compression of the cochlear nerve or the blood vessels which supply the cochlea. It is of utmost importance for patients who are diagnosed with an acoustic neuroma to be under the care of a specialist. Health care professionals usually involved in the treatment of acoustic neuroma may include an otolaryngologist, neurotologist (an ear-nose-throat medical specialist who obtains an additional subspecialty in conditions of the ear), neurosurgeon, radiotherapist (a specialist in radiotherapy), interventional radiologist, and audiologist. If you or a loved one has been diagnosed with an acoustic neuroma, it's critical to learn everything you possibly can about this condition so that you can make informed decisions about your treatment. That's why we created the Medifocus Guidebook on Acoustic Neuroma, a comprehensive 151 page patient Guidebook that contains vital information about acoustic neuromas that you won't find anywhere in a single source. The underlying causes of acoustic neuromas. The risk factors that can increase a person's chances for developing an acoustic neuroma. An overview of the relationship between a condition known as neurofibromatosis, type 2 and acoustic neuromas. The signs and symptoms that are associated with acoustic neuromas. How acoustic neuromas are diagnosed based on factors such as signs/symptoms, patient history, physical examination, imaging studies, and special auditory (hearing) tests. Preserve hearing for those patients who have intact hearing function. Prevent the spread and progression of the acoustic neuroma tumor. Enable patients to maintain a reasonably good quality of life. The role of "watchful waiting" (observation without treatment) in the management of people with an acoustic neuroma. The important clinical factors that doctors take into consideration in deciding whether or not surgery is necessary for the treatment of an acoustic neuroma. The surgical treatment options that are currently available for the management of acoustic neuromas, which include partial tumor removal and total tumor removal. The advantages, disadvantages, and complications of the different surgical approaches for the removal of acoustic neuromas. A comprehensive discussion regarding a non-surgical treatment option , known as stereotactic radiosurgery or Gamma knife, that has recently become available for the treatment of a variety of tumors, including acoustic neuromas. The risks, benefits, and complications of stereotactic radiosurgery as a treatment modality for acoustic neuromas. The prognosis (outlook) for people with an acoustic neuroma and the important factors that have a significant impact in predicting the overall chances of recovery. Quality of life issues that often confront people with an acoustic neuroma and how to minimize their impact and cope better with these issues. Important questions to ask your doctor about acoustic neuromas. A Guide to Recent Medical Literature on Acoustic Neuroma - This section of the Guidebook contains an extensive bibliography of over 100 references to recently published articles about Acoustic Neuroma in authoritative, peer-reviewed medical journals with links to the absracts (summaries) of the articles. These articles represent the latest advances in the field and focus on cutting-edge research, new developments, and the lessons learned from recently published clinical trials involving patients with Acoustic Neuroma. This is the same level of that is used by doctors who treat people with Acoustic Neuroma to keep abreast of the latest developments and breakthroughs in this specialized field of medicine. Centers of Research for Acoustic Neuroma - We've compiled a unique directory of doctors, hospitals, medical centers, and research institutions with special interest and, in many cases, clinical expertise in managing people with Acoustic Neuroma. The "Centers of Research" directory is a valuable resource for quickly identifying and locating leading medical authorities and medical institutions both within the United States and other countries who are considered to be at the forefront in clinical research and treatment of Acoustic Neuroma. You'd have to spend days - or even weeks - attempting to compile your own list of doctors and medical centers but, with the "Centers of Research" directory, the information is already right at your fingertips. All you have to do is act on the information by selecting and contacting the experts or medical institutions listed in the directory by state and country. 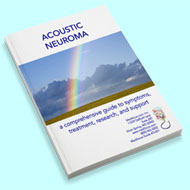 Organizations and Support Groups for Acoustic Neuroma - The Guidebook also includes a directory of organizations and support groups whose goal is to help people with Acoustic Neuroma by providing access to information, resources, and services. Many of these organizations can answer your specific questions, enable you to "network" with other patients, and provide guidance in areas such as financial, social, or medical-legal issues. This valuable directory of organizations and support groups includes complete contact information, including phone numbers and E-mail addresses. 20% Discount - For a limited time, you can purchase the Medifocus Guidebook on Acoustic Neuroma at a special 20% discount off the regular list price. Your 20% discount will automatically be applied when you go to "Checkout". Order Your Copy of the Medifocus Guidebook on Acoustic Neuroma Today! The Medifocus Guidebook on Acoustic Neuroma is available in the following two convenient formats: Printed and Digital. "My husband was diagnosed with an acoustic neuroma this year. After spending the good part of a week looking for specialists and coming up short, we purchased the MediFocus Guidebook. Within minutes, we had online access to a comprehensive summary about acoustic neuromas along with a detailed list of physicians and hospitals that specialize in this condition. Thank you, Medifocus...your Guidebook was a truly invaluable resource for us." "The MediFocus Guidebook on Acoustic Neuromas was a very useful resource that enabled me to make a difficult choice with confidence about my treatment. I would recommend this guidebook to other patients with acoustic neuromas an in-depth understanding about this condition and learn more about the various treatments available." "The Acoustic Neuroma Guidebook not only provided me with a comprehensive understanding about a condition that I knew nothing about, it also explained in clear language the treatment process and the possible complications. Thank you for providing such a valuable book to patients suffering with this condition."